What is a Gantt Chart and Why is it Important? What is a Gantt Chart and why is it important? A Gantt chart is a type of bar chart, adapted by Karol Adamiecki in 1896 and independently by Henry Gantt in the 1910s, that illustrates a project schedule. It is a graphical illustration of the duration of tasks against the progression of time. Gantt charts are useful tools for planning and scheduling projects. A Gantt chart in Excel represents projects or tasks in the form of cascading horizontal bar charts. A Gantt chart illustrates the breakdown structure of the project by showing the start and finish dates as well as various relationships between project activities, and in this way helps you track the tasks against their scheduled time or predefined milestones. A Gantt chart makes it easy to understand the steps required to a project, thus enhancing organization and improving the chances of success. One of the biggest benefits of a Gantt chart is the tool’s ability to boil down multiple tasks and timelines into a single document. Stakeholders throughout an organization can easily understand where teams are in a process while grasping the ways in which independent elements come together toward project completion. The above image is an example of a Gantt chart created to plan the construction of a villa. It is an actual screenshot of Gantt Excel. It’s the most intuitive and easy way to build a chart quickly, right within excel. 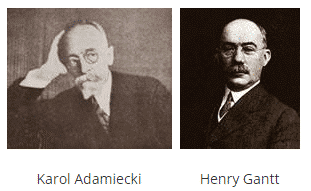 The first Gantt chart was devised in the mid 1890s by Karol Adamiecki, a Polish engineer who ran a steelworks in southern Poland and had become interested in management ideas and techniques. Some 15 years after Adamiecki , Henry Gantt, an American engineer and management consultant, devised his own version of the chart and it was this that became widely known and popular in western countries. Consequently, it was Henry Gantt whose name was to become associated with charts of this type. Originally Gantt charts were prepared laboriously by hand. Each time a project changed it was necessary to amend or redraw the chart and this limited their usefulness, continual change being a feature of most projects. Nowadays, however, with the advent of Gantt Chart Templates and project management software, Gantt charts can be created, updated and printed easily. Today, Gantt charts are most commonly used for tracking project schedules. For this, it is useful to be able to show additional information about the various tasks or phases of the project, for example how the tasks relate to each other, how far each task has progressed, what resources are being used for each task and so on. If you use Microsoft Excel, you can create a Gantt Chart/ Project Timeline/ Schedule with almost no learning curve by downloading our Gantt Chart Excel Template. Excel is instantly familiar, so everyone on your team “gets it” and hits the ground running. Our Gantt Chart template is completely automated and it is super easy to use. Download it now and you’ll have a professional-looking Gantt chart in minutes. Gantt Chart Excel Template is completely automated and is super easy to use. Gantt Excel gives you the ability to see every step of your project from beginning to end. 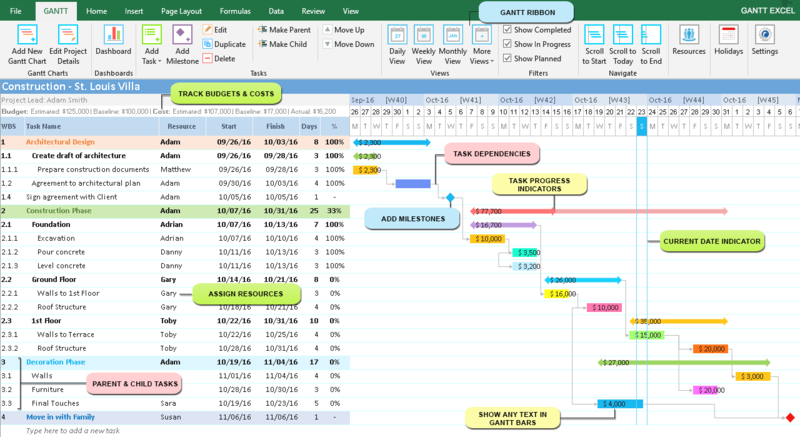 Our Gantt Chart Excel software lets you visualize every project step. You can create tasks and link them using dependencies, and then track their progress against deadlines and milestones.